A couple of posts ago, I blogged about Sarah Palin's intentions to run for US President in 2012. She did start a PAC, and her name was listed in the Federal Election Commission's Web site as a candidate for President in 2012. Other people took both of these happenings as a strong indication of her ambitions, in spite of her denial, "No, not at all, not at all, no," when asked if her PAC signaled her intent to run. I was not the only one to notice these events. Apparently, though, if someone starts a "committee-to-elect" someone (like David L. Kelly of Colorado Springs, CO -- coincidentally home to beleaguered ex-pastor Ted Haggard -- apparently did), they have to give the name of the someone they want to see elected. So it might have been possible that someone other than Sarah, and without her knowledge or approval, filed with the FEC and listed her name, and that's how she came to appear in their database. Fine, I said. Maybe some of the Team Sarah people got ambitious (a couple years early). Then I went back to check the FEC filing today. And surprise, surprise, Candidate ID P20001939 has been wiped from the database. So, okay, what happened? Did David Kelly change his mind? Did Sarah tell him to put the KABOSH on any public announcement of her ambitions? Inquiring minds want to know. Especially in light of the recent ethics violations filings, and how absent Sarah has been from Juneau or any pressing Alaska Governor issues. Is she mounting a stealth campaign now? Stealth seems to suit her ... in fact, one might say that deception is her modus operandi. I've been puzzling for a few days about how to proceed in my campaign to keep shining light on the politician from Alaska who has made it obvious she has national aspirations. Every time I start writing a blog entry, the research I do uncovers yet another great take on the falsehoods or deceptions or outrageousness of Alaska's current Governor. So what I've decided to do is re-hash what has already been said, and along the way, if I can uncover anything new, I'll post it. Current categories for future posts are lies, contradictions, and things that are missing. Sarah was surprised in late August, 2008, to learn that she was selected to be McCain's VP pick. The truth is that Sarah likely knew well ahead of the announcement, that she would be named as McCain's running mate. Sarah ignored the ruling and results of the Legislative committee charged with investigating Troopergate. Sarah says, in full voice, that she was cleared of any wrongdoing. The report clearly states that she was guilty of ethics violations. Sarah claimed that she was responsible for telling the US Congress, "Thanks, but no thanks," when it came to a hefty earmark for "the bridge to nowhere." The truth is Sarah pushed hard for that earmark, and only when it was nationally laughed at did she back off her support. And then, even though the specific project was canned, the Congress still provided the funds which were used for general infrastructure projects. Sarah did not return one cent of the money as she implies. Sarah claims she has shown her medical records, proving that she gave birth to Trig. The truth is, she has not permitted even one medical record to be released. 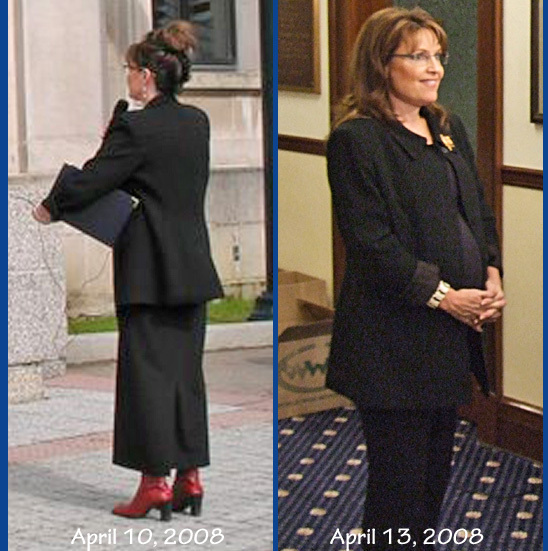 Sarah says on one hand that she hid her (alleged 2007-2008) pregnancy with fashion-assisted camouflage, and on the other that she did nothing to hide it because she believed that women need to show they can do a job and have babies too. Sarah claims on one hand that the McCain campaign kept her from doing more interviews with members of the press, and on the other, that the McCain campaign insisted she keep on with interviews (esp. Katie Couric) even when Sarah felt they were not going well. Sarah's spokesperson keeps insisting that Sarah is keeping Alaska first now, and has only initiated SarahPAC so that she can "draw a bright line" between her activities as governor and her activities as a potential 2012 presidential candidate. Meantime, Sarah does not have time to meet with Alaska's Mayors, or travel to Emmonak, or show up in Juneau during the current legislative session -- but she does have time, for instance, to go to D.C. for the Alfalfa Club dinner among other self-promotion activities. Sarah blasted media in general for failing to take the extra step to investigate dastardly rumors concerning her alleged maternity, yet when her own state's premier news organization tried to get unbiased, verifiable information to disprove the rumors, she refused to provide it, calling the requests outrageous. We've got no confirmation of the date of birth, or the place of birth, for Trig Palin. 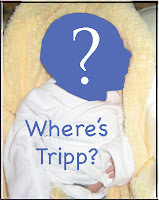 Following what seems to be a pattern, we also have no confirmation of the date of birth or place of birth (not to mention proof of birth) for Tripp Johnston. This is critical because if Bristol was pregnant with Tripp and gave birth to him in December 2008, that makes it extremely unlikely that the rumors that Bristol is Trig's birth-mother are true. I'm sure there are plenty more lies, contradictions and things that are missing. But that's a start! Let me know if I should include more items on any one of these lists. I plan to do individual blog posts for each. I've been hoping you would realize the futility of pursuing a national political career. In fact, I've been waiting for signs that you were going to be content to remain in Alaska and keep "progressing that great State" until you were voted out of office by another candidate for Governor come 2010. And then I was not going to spend more time on my blog pointing out your weaknesses, foibles, and deceptions. But then I heard you started your very own political action committee (PAC). And sure enough, you did. I won't link to it, because anyone with access to Google can find it easily enough. If that weren't bad enough, a poster at Alaska Daily News (ADN) noticed that you've filed with the Federal Election Commission (FEC) as a presidential candidate for 2012. And I'll be darned if you didn't do that too! Just so that folks don't think I'm making this up, here's the link to the record image showing your "Office Sought: President" in "Election Year: 2012" filing. So, quit blaming the media and the bloggers, Sarah. You entered national politics and you've now clearly stated your intention to remain a contender. The gloves are off as far as I am concerned, and everything that can be known, or figured out, about you is fair game for exploration and discussion. Count on endless replays of Katie Couric interviews and that Sarkozy spoof. Look for Bellygate to keep on growing. Watch out for those fresh ethics complaints and a revival of interest in who told the Troopergate truth. Then there's Pebblegate and the elephant in the room, Gaslinegate. It should be a fun couple of years ahead! Back in late August, 2008, the media and blogosphere were asking, "Sarah who?" John McCain's VP pick took a lot of people by surprise, so those who like to be informed about Vice Presidential candidates started trying to find out about Sarah. When Sarah introduced herself to the country from Ohio on August 29, 2008, she presented four members of her family as well -- husband Todd, daughters Bristol, Willow and Piper, and baby Trig. Bristol was wearing a burp-cloth and nestling Trig during Sarah's speech (video). Immediately, the Internet began buzzing about rumors (that had already persisted for many months in Alaska) suggesting Bristol was the one who had been pregnant with Trig, not Sarah. McAllister was an Anchorage TV reporter before working for Palin. He said Palin once approached him - before people knew she was pregnant - assuming he'd been hearing rumors. "She said it's not true about Bristol," McAllister said. At the time, the rumor would have been that Palin's daughter was pregnant. Three days after Sarah's entrance on the national stage, through a statement released by the McCain campaign on 9-1-2008, Sarah acknowledged that one rumor was, at least sort of, true. Bristol was expecting a baby. She was "about 5 months along," according to an aide who asked not to be named (CNN). The campaign said this news was released in order to squelch the other rumor that Sarah was not Trig's biological mother. Someone who gave birth 4-1/2 months ago could not also be 5 months pregnant. At that time, the Internet storm subsided somewhat and people took a "wait and see" approach. Would Bristol deliver on or about her (first announced) due date of December 18? It turns out that there has been a birth - maybe. All the media outlets who picked up on the story referred to People Magazine as the source. According to People, Bristol's great-aunt (who lives in Washington State) got an e-mail from Bristol's grandfather, Chuck Heath, saying that Tripp Easton Mitchell Johnston was born to Bristol Palin and Levi Johnston on Sunday, December 28, 2008 and weighed 7lbs 4oz. The date and birth weight shifted a bit over the next few days and is now reported as taking place on Saturday, December 27, 2008 / 7lbs 7oz. The same issue of People tried to get a statement from Sarah. The people who were waiting and seeing since September 1, 2008, are still waiting but not seeing anything yet. Where's Tripp? In order to make sense of the vast flow of information in which we bathe daily, we need to acquire the ability to discriminate -- to become discriminating, to be able to distinguish between the objective and the subjective, to discern the difference between an original and a copy for example. This skill is not routinely taught in even our best schools, although a broad education lays the foundation for acquiring it. What we can see or know or understand (S-K-U) is a function of what we allow ourselves to S-K-U. We must draw upon the times we have stretched our minds to encompass all that we might S-K-U had we taken the time and spent the energy to really think about the subject. I truly believe [...]. I have never questioned it. If we never question, are we not then willing dupes? Think back to January, 2003. We were told Saddam's Iraq posed a grave, looming threat. We were told about massive stockpiles of Weapons of Mass Destruction and Saddam's desire to unleash them on us. Some of us never questioned it, but the information was untrue and acting on that belief, we ended up losing and wasting many precious things. Believing without sincere, in-depth questioning is always dangerous. Has not belief in one or another radical religious tenet or political principle caused untold death, destruction, torture and suffering throughout human history? The first step to S-K-U what is right or true is to question. Here is a simple practice that can be done anywhere. 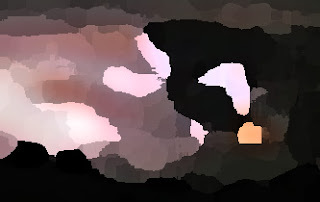 Select an event or object from daily life and ask oneself questions about it such as: what are its origins? how did it occur? what is it made of? what will happen to it over time? who has been involved in it? Attempt to explore the event or object in as many different ways as possible. Unless we acquire and practice the ability to be discriminating, we will surely fail to achieve our potential as individuals and as a society. And in that case, we become nothing more than cogs in someone else's machine -- used and eventually discarded when we wear out. The image on the left (source here) was taken in Juneau, Alaska, on April 10, 2008. The image on the right (source here), according to KTVA's Andrea Gusty, was taken on April 13, 2008. I confess to a certain morbid fascination with the doings and sayings of Sarah Palin, the current Governor of Alaska, former runner up in a beauty pageant, and former (thanks to a citizenry who was so fed up!) candidate for Vice President on the Republican ticket. I also confess to a persistent curiosity regarding the numerous scandals that seem to surround her, much like the dirt cloud that surrounds PigPen. There are so many. Troopergate. Clothing-gate. Per Diem-gate. Bridge-to-Nowhere-gate. Pipeline-gate. Coal Mine-gate. Husband-as-shadow-governor-gate. E-mail-gate. Baby-gate. Etc, etc. It's baby-gate I want to blog about today. There are a few very fine sites out there examining this issue in great detail. As a result of reading them, I've been inspired to present some investigative results of my own. What follows is, I hope, a reasonable debunking of a particular image that supposedly shows a pregnant Sarah Palin during an interview with Elan Frank in April 2008, the same month that she supposedly gave birth to her 5th child, the Down syndrome baby boy named Trig. The sharpening accentuates where the real folds are in whatever covers the skin here, and makes it quite plain that both the upper and lower abdomen (the supposed pregnant belly) are demarcated by straight lines. What also strikes me here is how her pelvis is not encroached upon... that is, the lower part of the belly is still well above where her legs join her torso. And she's sitting. Which shortens or should shorten the distance. Yet we can see the lower line of the "pregnant belly" well above the tops of her thighs. The shadow at the bottom middle of the image looks to me to be where her pants fold under at her crotch. Now, let's take a look at real pregnant bellies. 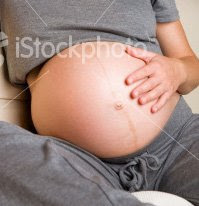 BTW, these images were all grabbed from Google by doing an image search for "pregnant woman sitting." Notice how ROUND these bellies are. Notice how especially the lower extremes of the shapes are quite ROUND. Now go back and take a look at Sarah's belly. The real pregnant bellies round out and virtually "sit" on the laps of the women. Yet Sarah -- ostensibly just days before delivering a normal-weight baby -- can somehow hold the full roundness up above her lap, and even square it off above her pubic region. I've had three children, and I can vouch for the fact that pregnant bellies are taut, tight even!, and very round. It's not like you have a bowl of jello inside you. It doesn't sound hollow when you "thump" your belly. It's solid, it doesn't give easily. There's your skin, a thin layer of fat and muscle, and then the incredible muscle tissue that is the uterus, then the amniotic fluid and then the baby. You could much more easily create a depression with a finger pressing into your inner thigh (unless you are a muscle-builder clenching those muscles) than you can with a finger pressing into your truly pregnant belly. I would also like to reveal that I used Adobe Photoshop Elements 6 for the modest manipulation I've done to the original image. If you have any information that either supports or refutes the notion that Sarah Palin is fibbing about all or part of her birth of Trig story, please leave a comment and a way to contact you!